The Tractor Supply Companies are having events this weekend and we will be setting up our market tent on Saturday March 10 from 8 to 2. Not sure exactly what it is, but I think it’s related to “Chick Days”. Chicks and ducks are now available for sale and be warned, it’s very hard to resist them. 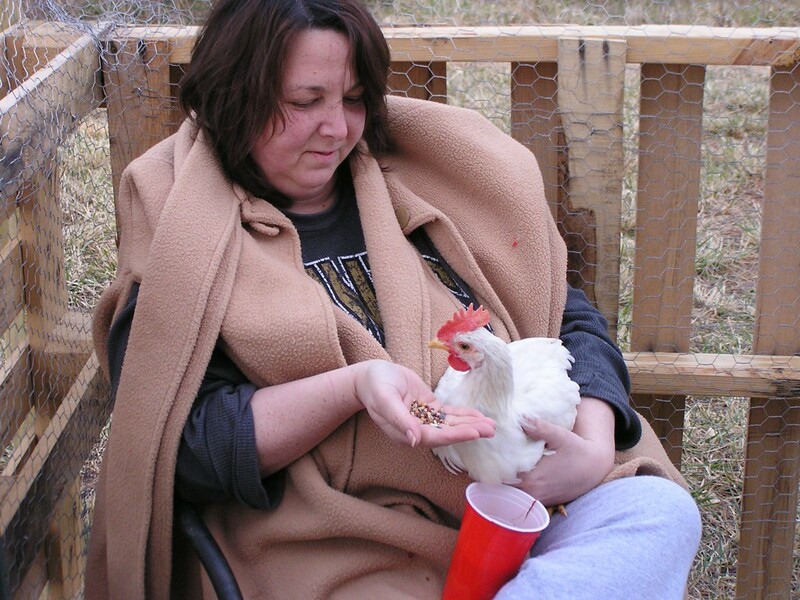 Pet Chickens of Virginia is an online community that regularly does “swaps” at TSCs all over the state. 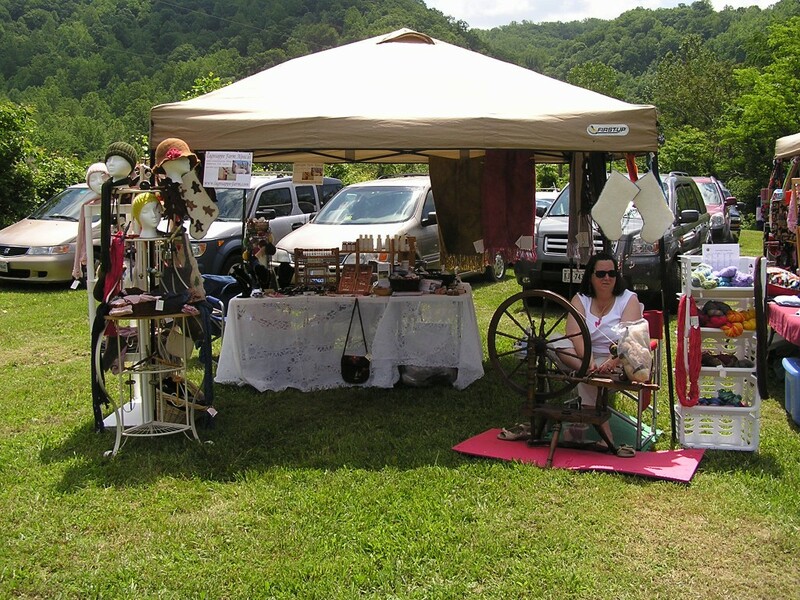 The Orange swap’s regular date for March is the 17th, so we will be there 2 consecutive weekends. PCOV is a great website and forum with knowledgeable people and I’ve relied on their experience a number of times. At the swaps you will find all manner of poultry and fowl, including peafowl and turkeys and also rabbits. This will be our first time vending with this group and hope that it will be a good experience for us. Last June, I attended my first and only swap as a buyer and came home with 4 young pullets. If we do well these 2 weekends, we will setup there instead of the Orange Farmers and Artisans market on the dates the swap will be held. Our market’s summer season will be starting the first weekend in May, which we will miss. We are heading to Marlyand Sheep and Wool that weekend for a much needed fiber fix. Check back for what I will be doing with what I bring back home with me. Hope to see some of you there. We will be having all our regular alpaca items for sale along with my new tote bags, aprons and egg ornaments. Here are the swap dates for 2012. 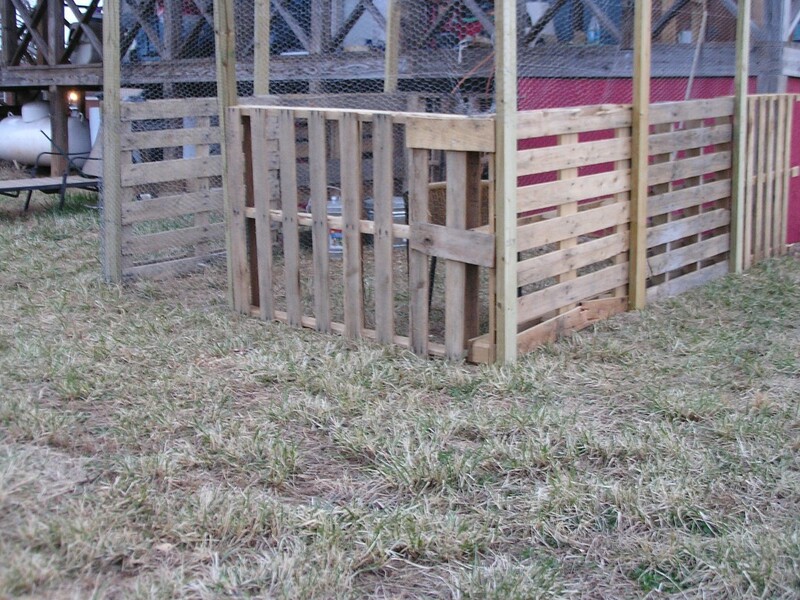 So, I’ve finally used some of my pallet hoard to create a fence for our chicks’ run. Part of it is temporary because it needs to be enlarged. 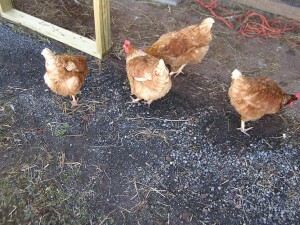 We have 23 chickens, who just turned 2 months old and the run will not be large enough to sustain that many chickens. 8 of them will be leaving the flock starting in about 5 weeks. 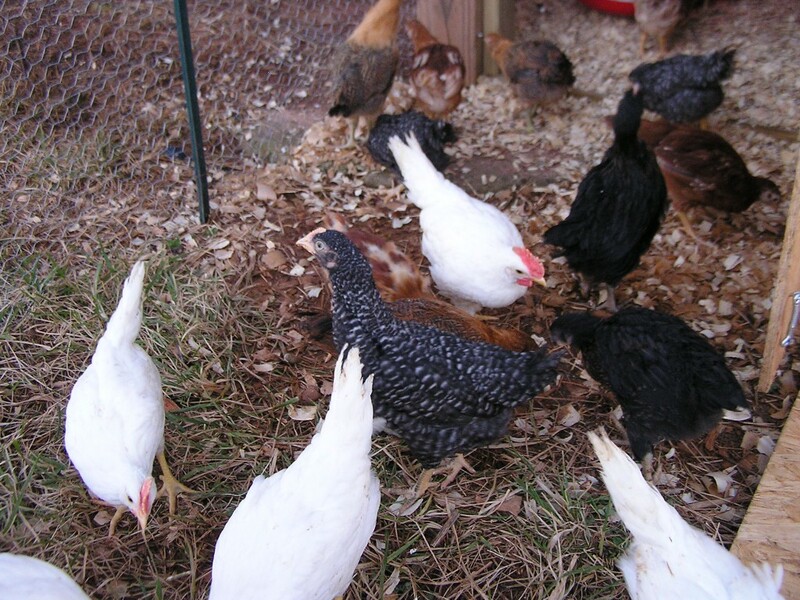 These are the White Leghorn roosters that were added to our pullet order for packing peanuts. We plan on eating them and will be thankful for what they provide to us and in return, they are getting great care and even hand fed sometimes. That will leave us with 15 hens. It’s recommended that they have 2-4 square feet of space for each one. I do like when they want me to pick them up and get special treats, even if it’s one of the soon to be eaten roosters. In the photo above you can see the right side wall which is the temporary wall. In the future, the run will be larger with this one moving over to the back side of the coop incorporating a much larger area. It will probably be 7 or 8 more pallets longer and wider, providing plenty of space to these hens and allowing us to add a few more. The left side wall, shown in the photo below, will stay were it is and that’s where my first plantings will go. Now, what to plant??? I think strawberries are a given and so are herbs. I read something recently that said to incorporate thyme and marigolds for bug control and will try that. Plants that will be good for the chickens will also go here. I do want pretty things to make a pleasant atmosphere. As you can see in the photo, we moved our two lounge chairs from our front porch and hope to spend some nice evenings out here checking out the wildlife that live in our backyard and woods. We’ll set up our fire pit and I even have 2 half barrels that will also contain veggies and flowers. I’m hoping to have something similar to this, but much livelier and more colorful. If you have any experience with this type of gardening, would love to hear about what has and hasn’t worked for you and I’m taking suggestions for plants that will do well in this type of environment. Will update as I get things planted and harvested. Do you know your labeling requirements? In the past month or so, I’ve come across a number of people discussing labeling requirements, mostly for farm produced items. In Virginia, I think we are fortunate that there are many exemptions for the small farm producer. If you have purchased any of my products, you will know that I label everything and I do follow the regulations. Something you might not know or think about is how this adds cost to our final product. Mostly it’s time, but labels aren’t cheap. 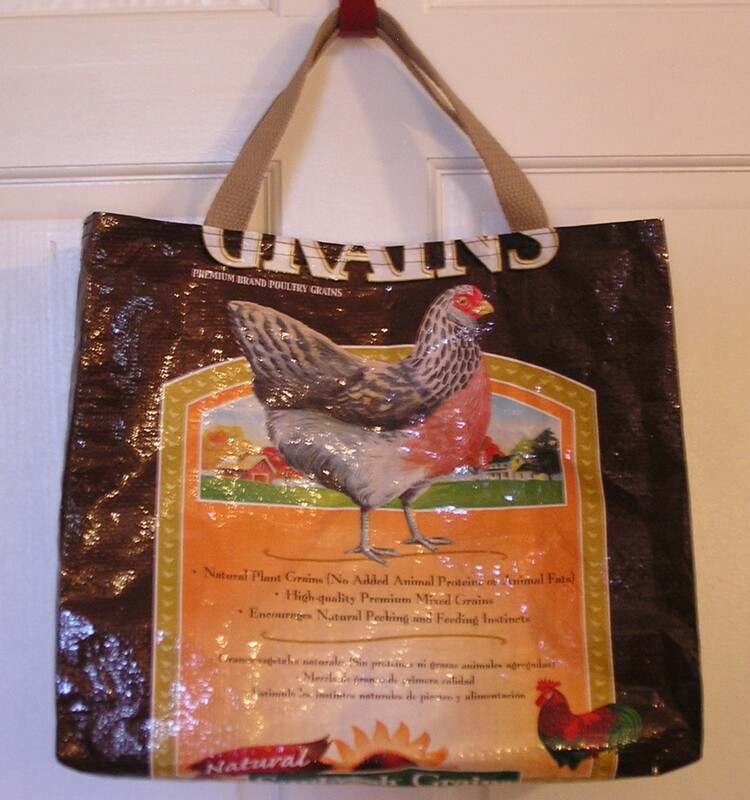 New egg cartons, if I can get them on sale with free shipping, cost 35 cents each. If you use a printer, you know how expensive ink is. Good software to create eye pleasing fonts and graphics is also costly. So what does this mean to you as a consumer? As a producer? For me it means that I can’t compete with the person who sells their eggs at the farmers market for $2 per dozen in used cartons. I sell mine for $2.50 per dozen with the request to return my carton. This is not that important to me now because we don’t sell our eggs at the market. We sell them all to friends and co-workers, but I would like to be able to compete if I ever have enough to do so. While I’m on the subject, please price your items appropriately when you are selling them. I know lots of people say they are not trying to make money, just getting rid of their excess. When you devalue your product, it lowers the value for everyone not just yourself. If you are not trying to recoup your feed cost or put money into your family budget, please think of others that are. I was reading the regulations of a farmers market here in Virginia that actually requires their vendors to maintain a price structure. “No vendor of produce may sell products at a price 10% below the current market value for retail farmers’ markets as reported by the VA Dept. of Agriculture”. Wow, good for them! I wish all farmers markets would adopt this practice. It’s good for the vendors and consumers alike. And if you are not trying to recoup your feed cost, why aren’t you? I would love to know why. Please leave a comment below so we can discuss this important issue. Anyway, off my soap box about pricing and back to the one about labeling. What does Virginia law state about selling eggs as a small producer? 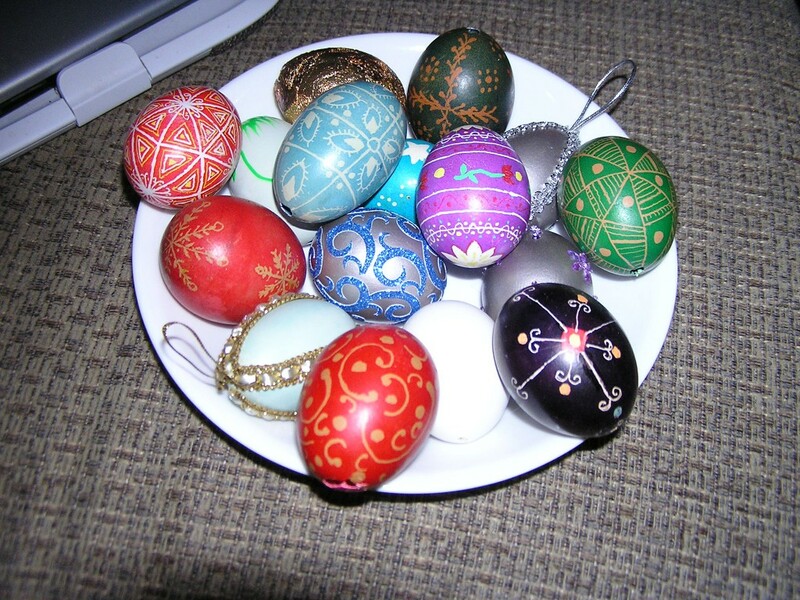 Grade: Eggs should be labeled with a suitable consumer grade (AA, A, or B) or “Ungraded”. 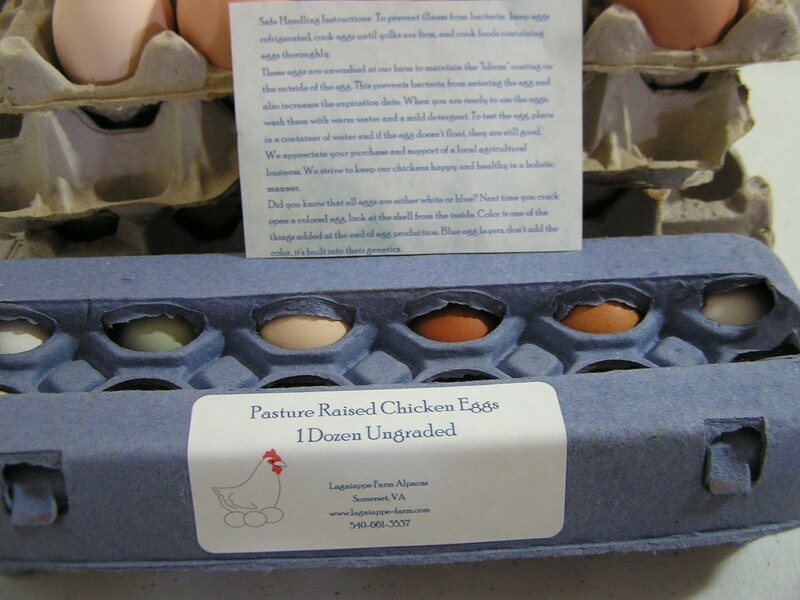 Eggs labeled with a consumer grade should meet the corresponding standards for that grade. The above quote came from a farmers market pamphlet, but they apply no matter where you sell your eggs. We don’t have our eggs inspected so our label says “ungraded”. We are also careful not to use the phrase “fresh eggs”. We use the term “pasture raised”. My safe handling instructions are tucked into the carton and contains the required information, instructions for washing (we currently don’t wash our eggs, but may in the future) and a fun fact about egg colors. So really, why is this so important? As a producer, why would you want to sell your product in someone else’s carton? Not only are you not giving them a way to contact you for more, you are giving the original seller free advertising. That’s not good for your business. I want to make sure that my customers have my contact information handy if they have any questions or want to recommend our eggs or any of our products to others. I also see this as a value added addition to our product. My cartons and my labels don’t look like anyone else’s and I think the personal touch is something consumers like when they are buying from a small business. Why would we want to be compared to a large chicken farm? 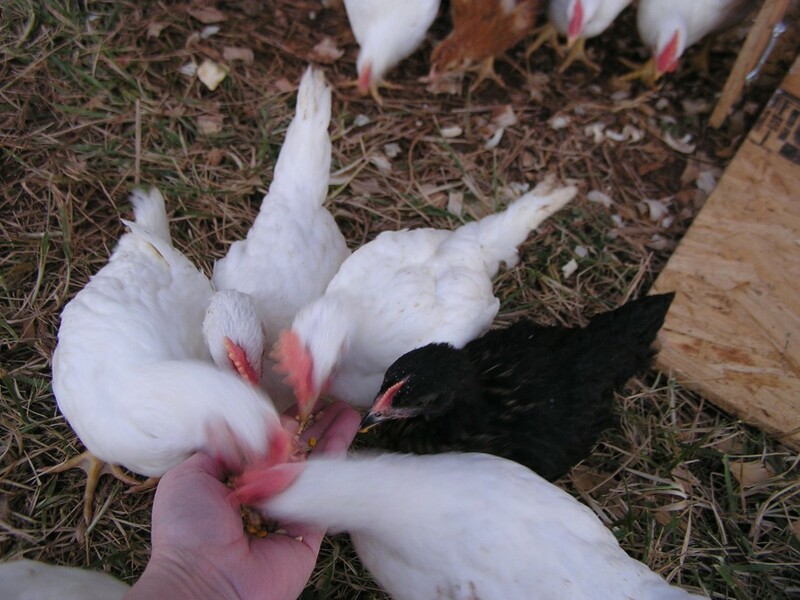 Our chickens free range and even though they are not pets, they get treats and some of them get picked up for beak scritches (yes, that’s a technical term!!) when they want them. It’s a pleasure to go to the barn and see chickens squawking and running to me when they see me walking into the pasture. They are happy to see me and I return their sentiment. They’ve made my life happier! Now you know what they are and where to find them. Would like to know your thoughts on the subject. Please leave a comment below and I’ll try to get an answer for you. Happy farming everyone! Our web site is getting a face lift, so please check back later for all kinds of new content. One of the new additions will be videos demonstrating fiber production on all levels. First up will be wet felting, so check back often to see what we’ve got going on over here at the farm. If your business is fiber, in my opinion, you should get to know as much about it as possible in all aspects. I do a lot of reading on all stages of alpaca fiber; on the alpaca, off the alpaca and before it even gets on the alpaca through genetics. As a hand spinner who processes and blends almost all my fibers by hand, learning how it’s processed on a large scale is a must. This past Tuesday, and hopefully all Tuesdays in the future, I’ll be heading over to Central Virginia Fiber Mill to work and learn as much as I can. The mill is an extension of Kearney Country Alpacas and only about 2o minutes from our farm, making it very convenient for me. I’ve had them process fiber into roving in the past and have been really happy with the end product. In the future, I’ll be able to have a bigger influence in how it’s processed. I’m mostly interested in felted sheets for making items like purses or clothing. Below is a Corriedale fleece I worked on that was to be turned into roving. *”The Corriedale was developed in New Zealand and Australia during the late 1800s’ from crossing Lincoln or Leicester rams with Merino females. 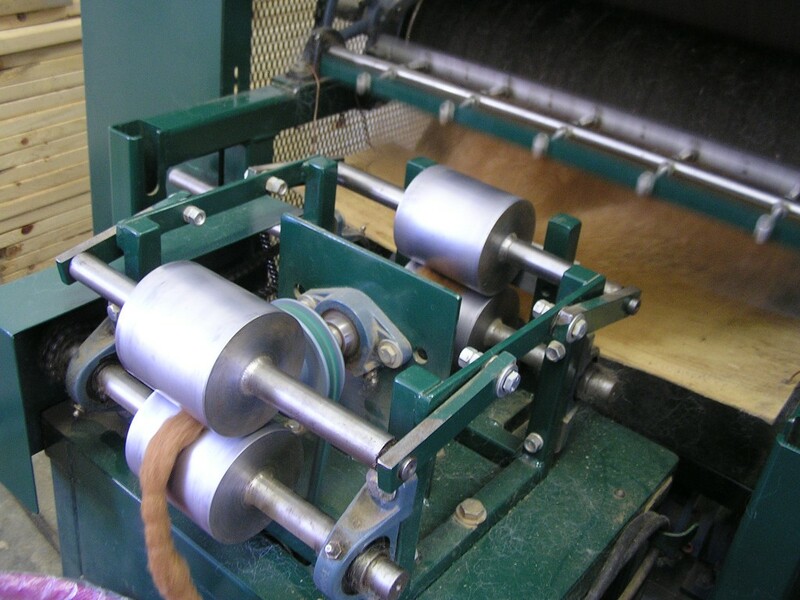 The Corriedale produces bulky, high-yielding wool ranging from 31.5 to 24.5 micron fiber diameter. 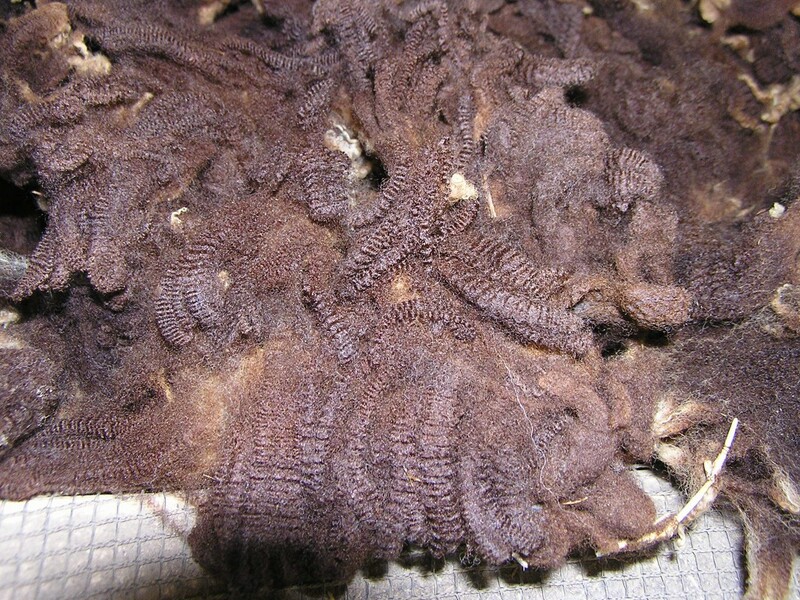 The fleece from mature ewes will weigh from 10 to 17 pounds (4.5-7.7 kg) with a staple length of 3.5 to 6 inches (9-15 cm). The yield percent of the fleece ranges from 50 to 60 percent. Mature rams will weigh from 175 to 275 pounds (79-125 kg), ewe weights range from 130 to 180 pounds (59-81 kg).” This fleece was a nice rich color and on the finer side of the range. I “skirted” this fleece to get it ready for washing. Mostly I was pulling apart the locks and opening them up in preparation for washing. If I saw them, I pulled out the second cuts or contaminated pieces, but you should know that the more skirting and prepping you do at home, the better your finished product will be. Your yield will also be something that can benefit from your skirting practices. 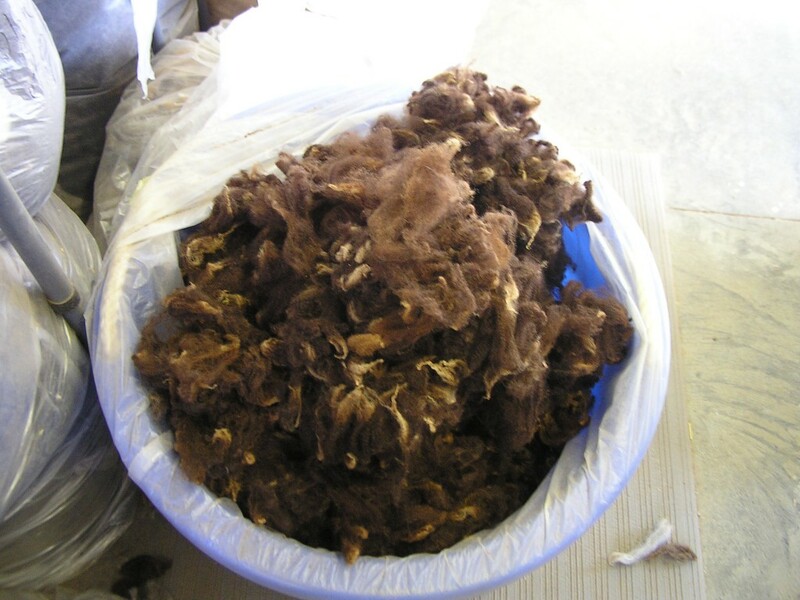 With alpaca, we should expect a small percentage of loss if your fleece is sent in to the mill fully skirted. Even better, if you are having your fleeces sorted and graded, your ratio for incoming to outgoing weight should be a lower percentage. Or is that a higher percentage??? Here’s some of the fleece after skirting and now ready to be washed. And here it is after being washed one time. 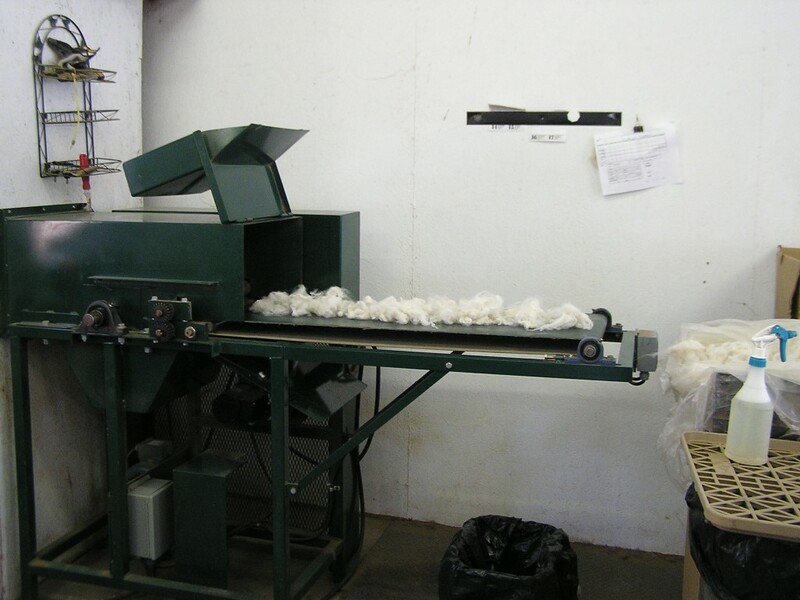 At the mill, water is used at 140 degrees and soaked in a specially made biodegradable detergent. This fleece is clean enough that it got one wash soak and one rinse soak. Here it is hanging to drain before putting into a washing machine to spin most of the water out of it. After a spin in the washing machine, fleeces are fluffed up and laid out to dry on a rack. It was sunny enough to have some outside this day. Here it is spread out and drying in our unusually warm January sun. 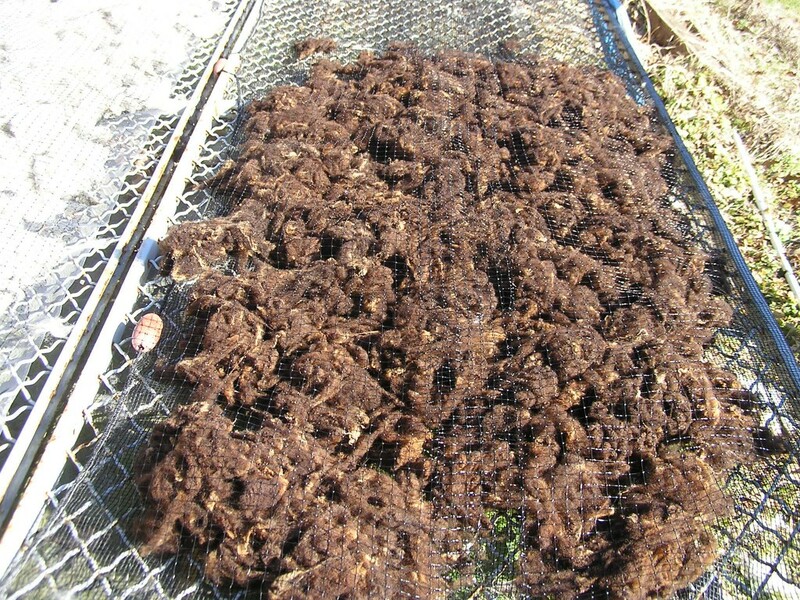 This fleece was still drying when I left, but other fiber was being processed. After drying, the next step is sending it through the picker. 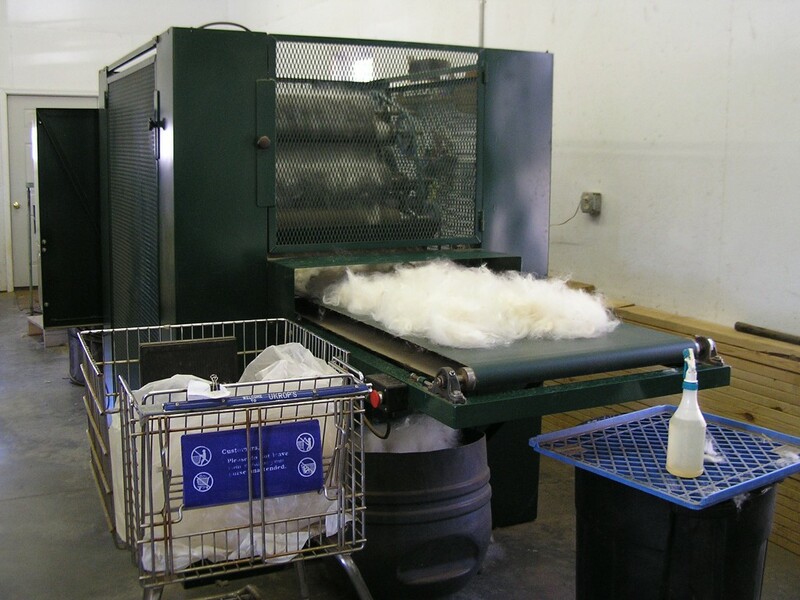 The fiber is fluffed and laid out on a conveyor that pulls it in. I’m going to be brief on these next steps. Look for future post about each part of the process. After being picked it’s ready for the drum carder. 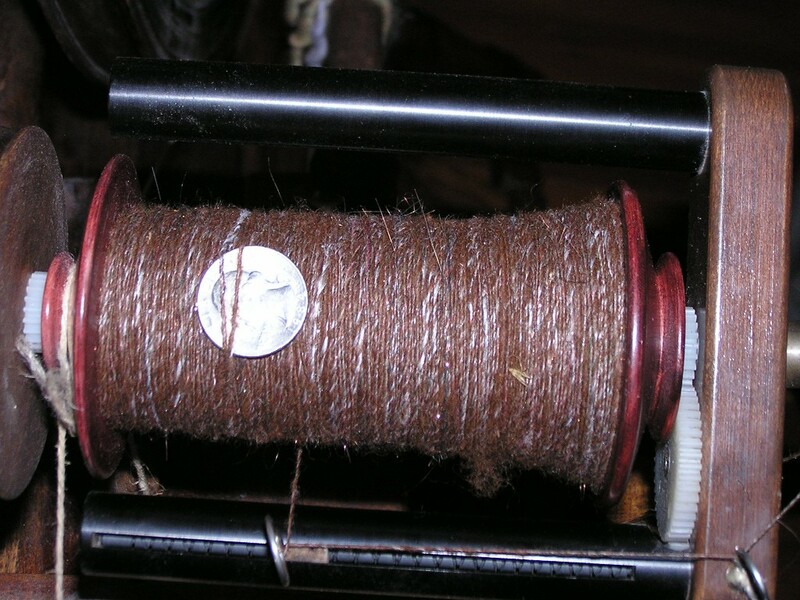 Here is the fiber being drafted into roving directly from the drum on the carder. 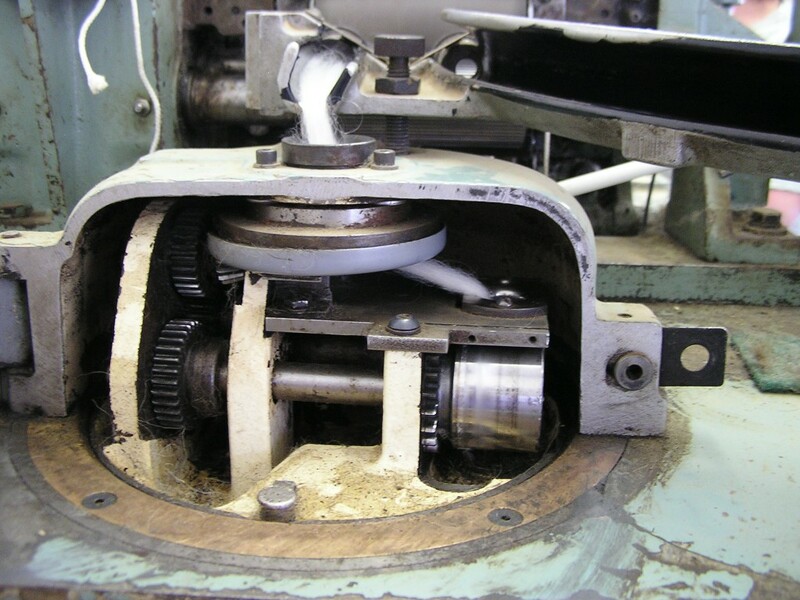 If you are a spinner, this can be your final preparation at the mill. 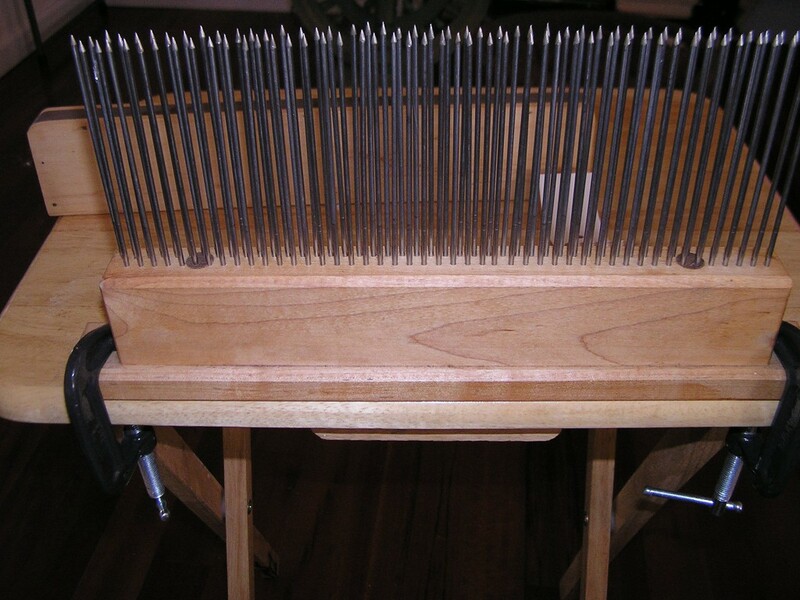 If yarn is what you want, it will go through a pin drafter, shown below. 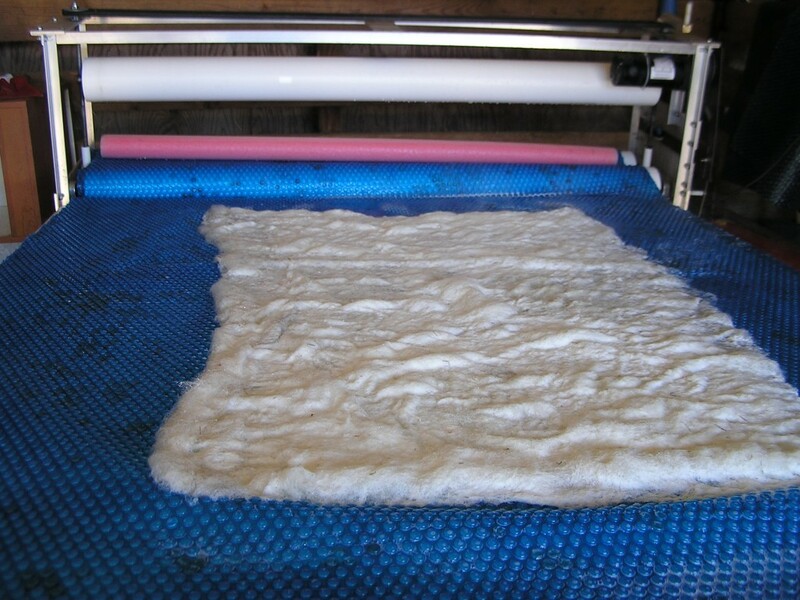 Carded batts are turned into fulled sheets on the wet felting machine. This is what I’m looking forward to the most with my fibers that I won’t use for spinning. There was no yarn being spun the day I was there, so will be posting about that in the future. I will also be talking more about how to prep your fiber for greater yield. Why pay for your trash along with your fiber? My next blog will be about the fiber I’m currently dyeing, so stay tuned and please do leave a comment below. I’ll be happy to answer any of your questions. *copied from the website in the hyperlink. 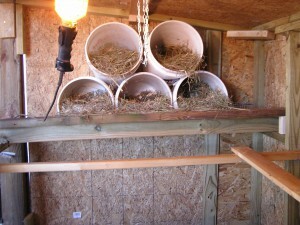 Just wanted to put up some pics of the coop we built into our back porch for our chicks who have just turned 6 weeks old. We wanted a natural earth floor, so I put down wire and then covered with sand. The next morning we saw a small hole around the cinder blocks and decided we couldn’t take a chance with something digging in there with the chicks. I had gotten a few pieces of pergo floor that my friend had from her remodel, so we used that. This next photo shows the front of the coop with the door on the left. 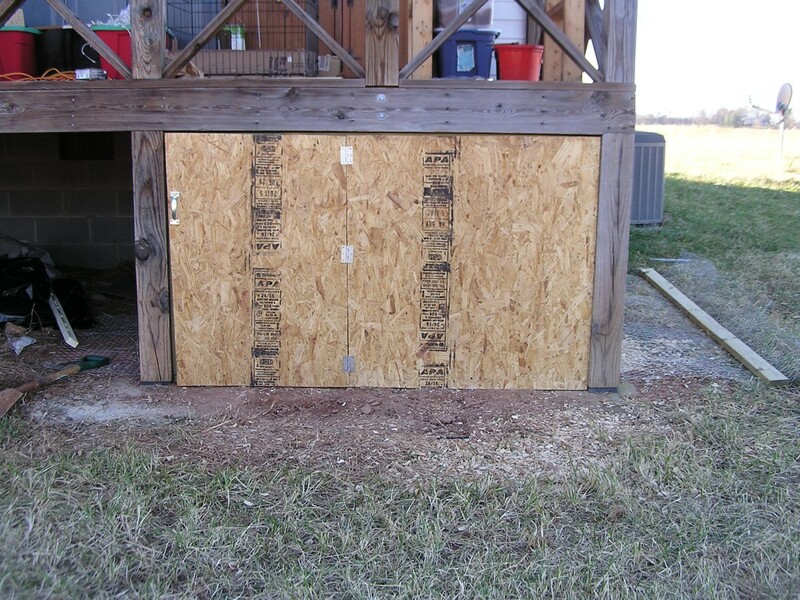 When the weather gets warmer, we are planning on removing the board on the right and replacing it with hardware cloth to make it an open air coop. We will have a little overhang around both sides and have a small run attached. I will let them free range while I’m outside with them. I recently saw a small hawk perched on the satellite dish you can see in the upper right corner of the photo, so I need to be prepared for that. I’ve also put the first coat of red paint on it. We put in a small window on one side and you can see the start of the small run I made for them. 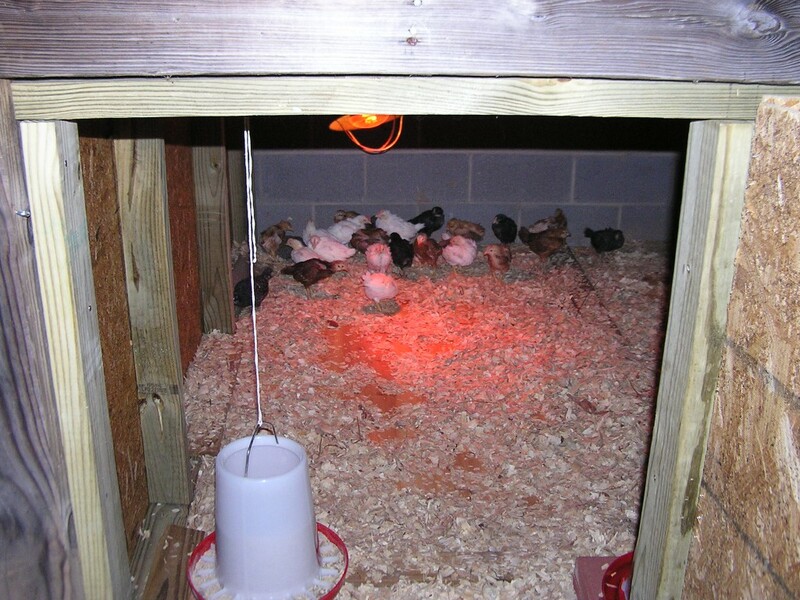 Chicks all in with their food, water and heat lamp. We are using pine flake on the floor. Some photos I took last week. Happy and growing! We worked hard all last weekend, but the wind was a big hindrance to us, especially on Saturday. It was so bad that Mark actually had to drop the sheet of plywood he was moving, it was dragging him along with it like a sail. It wasn’t so bad in the morning when we got going. First thing we did is remove the tarp that was stapled to the barn opening. What fun that was! Through the years, we have had many incarnations of wind blocks in our open barn plan. We’ve had plain opaque plastic tacked to the frame, we’ve made removable frames from the same plastic, we have had tarps tacked up. All of them have become shredded with the wind and ironically, this tarp that we wanted gone, didn’t want to come down! We had to cut the tarp around the staples. Murphy’s Law, I guess. The photo below is the opening with the tarp removed and a front view of Mark, who says all the pics I take of him working have him bent down and from the back. 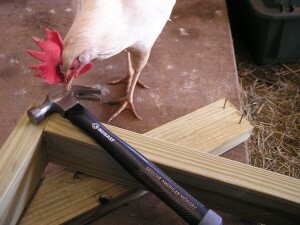 I just don’t know how we would have gotten all this work done without the help of the chickens. Or maybe that’s the reason we didn’t get it all finished. They really do a great job of getting all the creepy crawlies out of the way. I’m sure the egg yolks from that day were a little darker in color. I just love those fluffy butts! make sure you get them all! Below, we have all of the back wall frame up, the front frame set into the barn wall and the sides up without the inside supports. Because of the slope and where the plywood sheets were going to sit, we decided to put the side supports in after we had the first sheet of plywood installed to get an accurate placement for nailing. I also should mention that having the right tools for any job makes that job easier and faster. We are lucky enough to have all these tools because we built our own house with the help of my dad and 3 of my brothers. They came up from Louisiana for a few months to work on it. You can see our nail gun and our chop saw in the above photo. 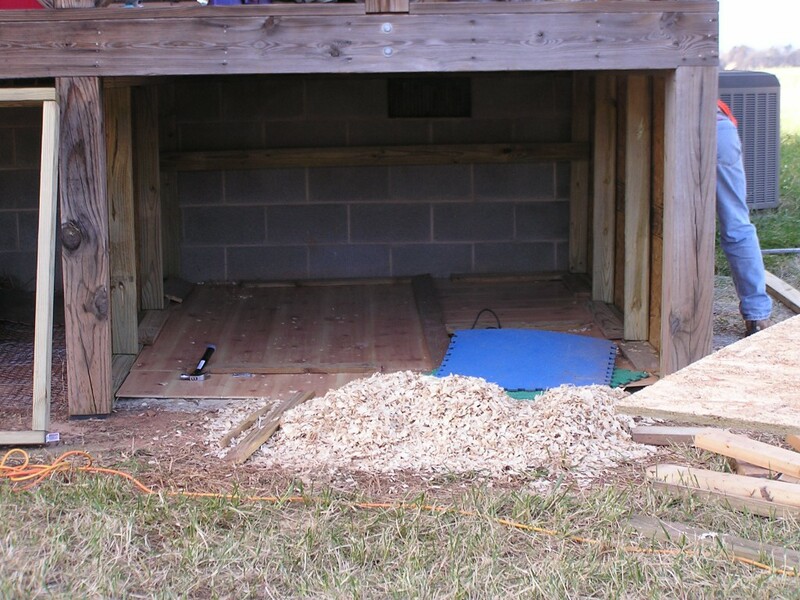 We were also working with a circular saw, a large level, a small square and a hammer. 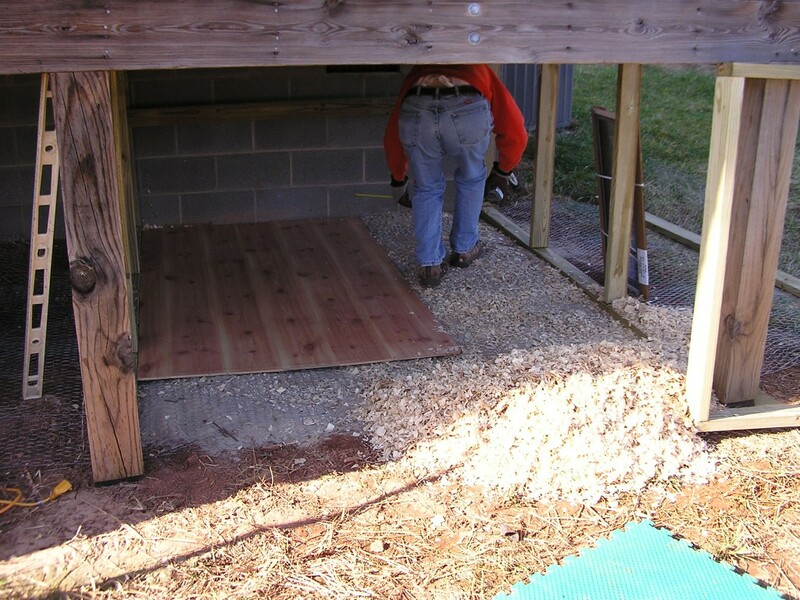 Below is a photo of Mark tacking down the plywood on the roof. Yay! We have walls and a roof! Well, two walls and a roof. 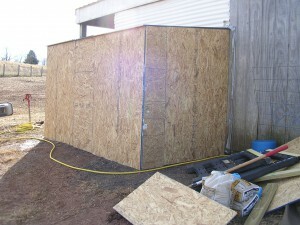 The winds were so strong we could not cut any more of the plywood to finish the other wall. And here’s one from the inside of the barn. I think this was taken Sunday morning, because I have a support brace on the inside right side. 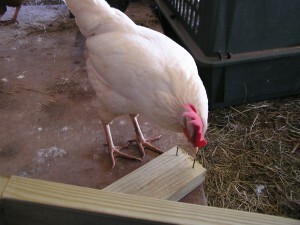 You can also see the chicken’s feeder hanging from an eye hook. 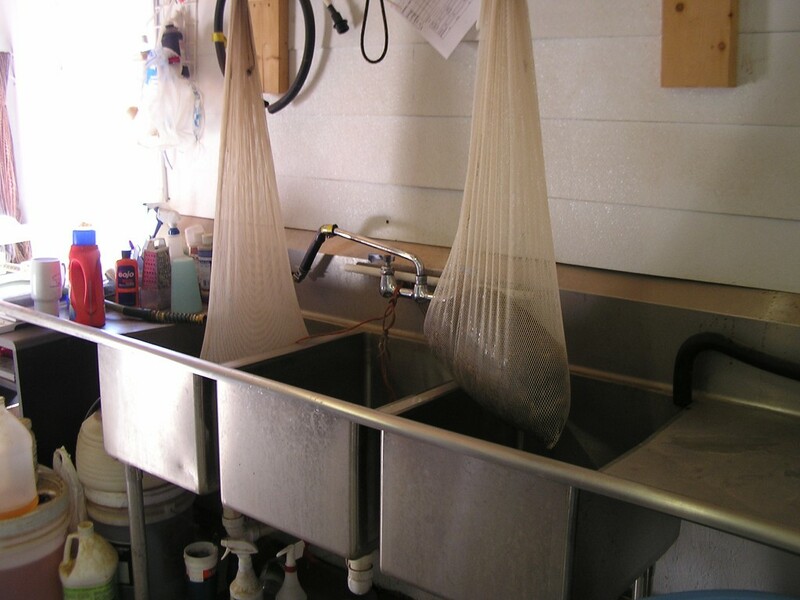 I put in a number of hooks to be able to hang the water and food in a spot that wouldn’t get soiled. 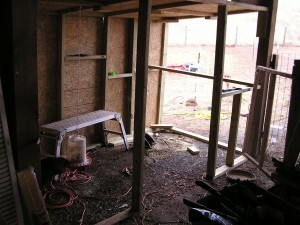 I’ve also put some horizontal supports for roost into the back wall. 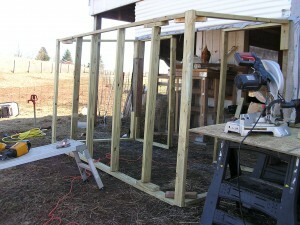 Finally got all the walls up and the inside supports for the left wall. We decided to have an earth floor so I put down some sand. 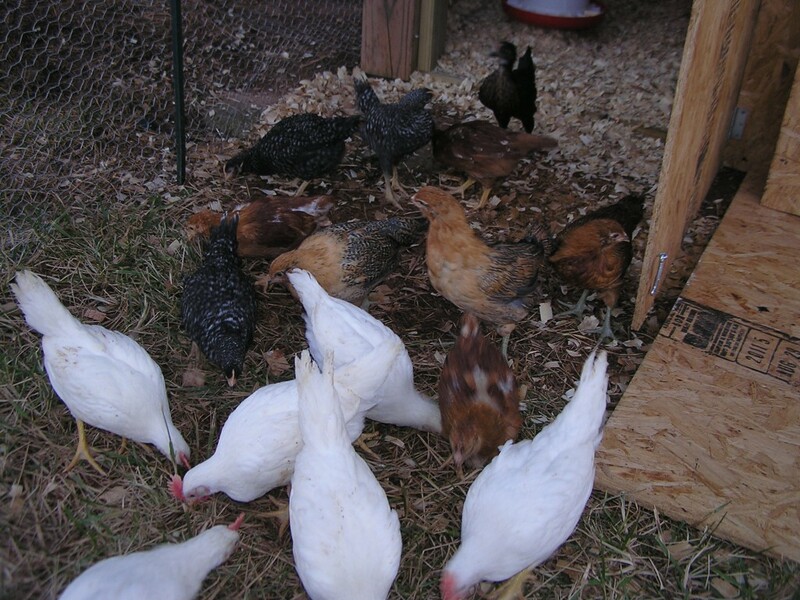 I want to work on having a floor that will support healthy organisms and I hope that will keep our chickens healthy. In the future, I will bury some wire on the outside of the coop edges at some future date. Mia does a good job of keeping predators away and we do have a perimeter fence that is electrified. I have never seen the chickens show any sign that they’ve been frightened and I hope that means nothing is trying to get in. I do think that the size of the alpacas probably also deters small predators. I decided to use 5 gallon buckets for their coop nest. 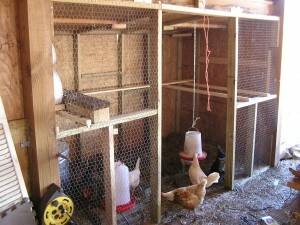 I think I saw them used on Backyard Chickens, though I did not use them in the same way. The buckets were cheap and they really are the perfect size. I had to build a support system that would keep the buckets up and in place but would also allow me to take the buckets down easily for cleaning. The bottom three buckets are stationary. 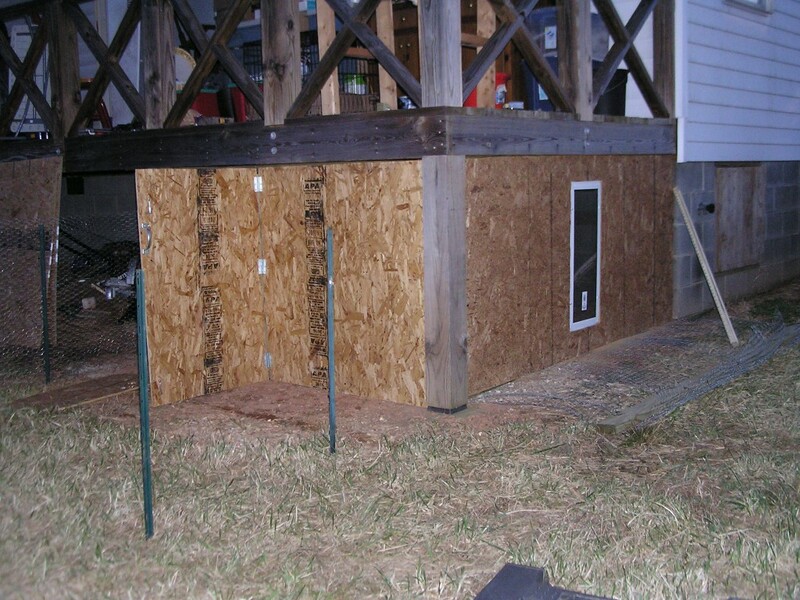 I put in a 2×6 ledge that will keep the eggs and hay from falling out and give the chickens a place to walk around while they are choosing which nest they want to use. 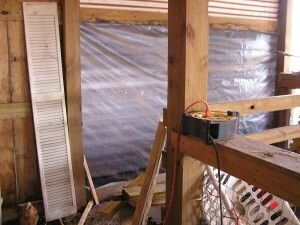 The two top buckets are attached with wire to keep them angled back a little and from rolling off. There’s also a 2×2 roost in front of the nests. The photo below shows the roost. 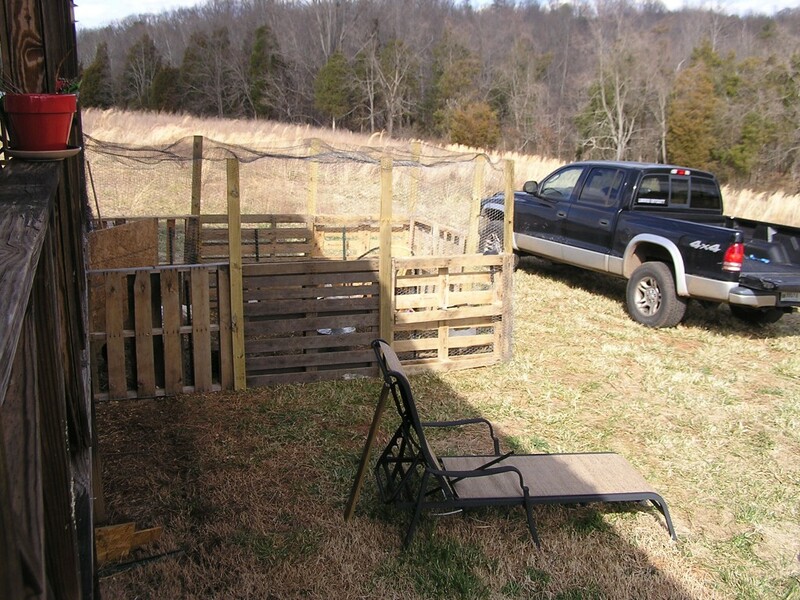 I have 2 roost built from 2x2s and one roost that goes along the back side of the coop made from a 1×4. I wanted them to have a choice of perch sizes. This is somewhat temporary. In the future I will be putting in some ladder roost. 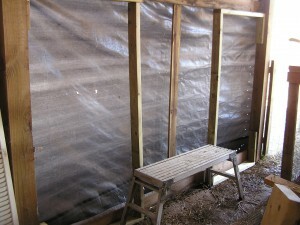 We were not able to finish up the front walls on Sunday, so we draped a heavy canvas sheet across the front to keep most of the chickens in over night. Monday morning I was at the barn early working on the chicken wire. 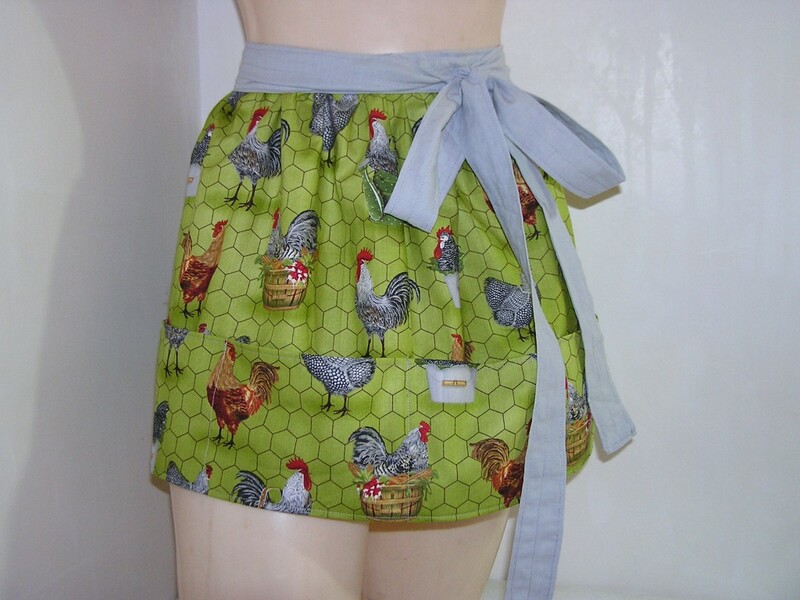 I decided not to use hardware cloth and use chicken wire instead, because this coop is mostly to keep the chickens in one place to lay their eggs and to keep Mia from eating those eggs. At this time, we are not concerned about predators getting to them. In the photo below you can see the food hanging from an eye hook and the trash can that contains their food under the nesting buckets. The heated waterer was just too heavy to hang with the chain I have. Something to take care of soon. And here it is with the chicken door and the very temporary human door. We still have a lot of work to do on it. We need to put paper, flashing and shingles on the roof. We need to build a real door and there is a lot of trim work that needs to go in everywhere, but for now it’s serving it’s purpose and the first morning after all the chickens where in, we got 13 beautiful eggs. Please do leave a comment with your thoughts or even ideas about improving it. 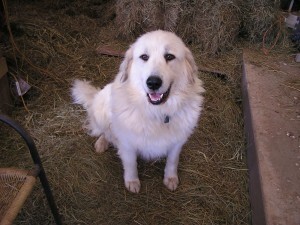 We’ve been having issues with our LGD Great Pyr, Mia, eating our chicken eggs. The fault lies with us, so I can’t really blame her. Our chickens don’t lay in the 3 nesting boxes in their tiny coop, they like to lay in either the hay bales or the alpaca hay bins. 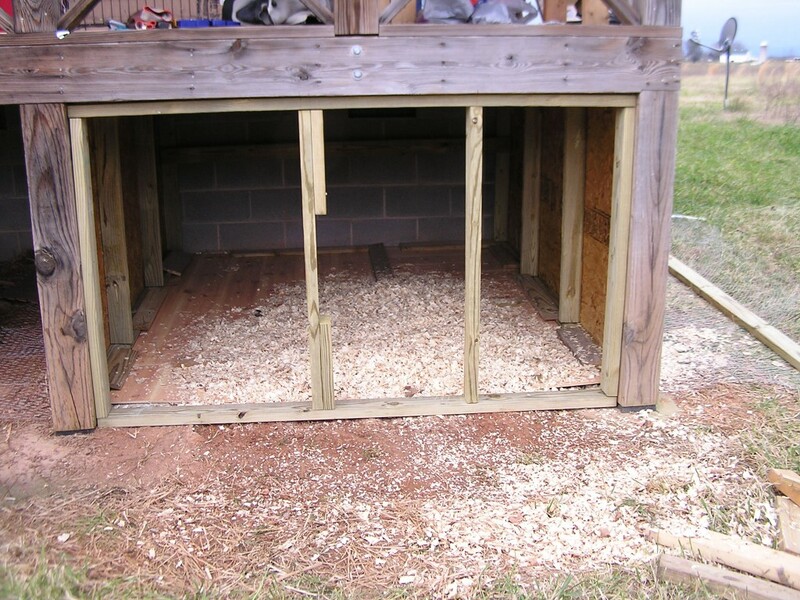 We will need to train them to go in nesting boxes, which means a bigger coop that can be closed off from the dog. 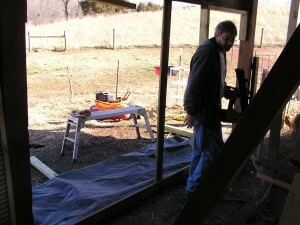 I decided that it would be best to have the coop open into the barn, making it a new structure. Our small coop is built onto one of our interior barn walls with a little run along side one of our alpaca pens. The new coop will face it and when we remove the old coop, we will have opened up that walkway a good bit. 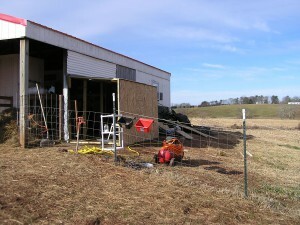 The photo below shows where the coop will be in the barn. 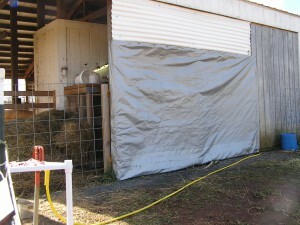 We currently have that area closed off with a tarp to keep the winter winds at a minimum for our open barn layout. And this is the outside of the area we will be building in. You can see the left corner of our small coop, along with all the hay stacked along the outside edge to insulate it. We had 35 plus hay bales that were moldy and we couldn’t use for food, so we currently have them all over the barn as wind blocks. The chickens love climbing all over this area and make a huge mess. Can’t wait to get rid of it! I spent about 4 hours out there today getting all the measuring done. I cut most of the 2x4s needed for the frame. The rest will need to be cut as we are building because I want a slanted roof and want to make sure the measurements are more concise. 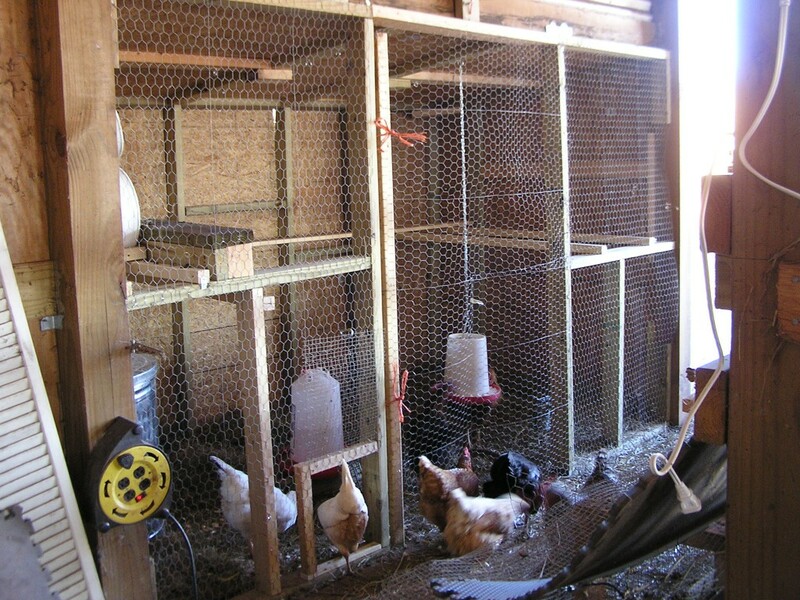 I want to have a door midway between two wire mesh walls, for access to the coop. I measured and cut the frames for both sides of the door and partially assembled them. Wow, I made that sound so easy! It was not!!!! I have a number of issues including a partially torn rotator cuff on my right shoulder and shoulder impingement syndrome on that same shoulder. Hammering is never good for that. It’s important to use the right weight hammer. Mine is lightweight, but it’s still heavy enough that I don’t have to swing more than I need to. My other issue was that someone thought she was actually helping me. Not sure what was up with her, but she kept coming over to peck my hands or where I was hammering. She’s lucky I could see the humor in the situation.
" I can help you with these nails. I really can!" Wonder if Kobalt needs a new spokesperson? As a woman, I really don’t like saying that men can do more than us, even though it is true sometimes. Mostly, it’s just that we need another hand to help hold and stabilize things. Moving a heavy frame would be hard for anyone, but it can be done. I like to use up all my end pieces of boards, so my frames are a little funky sometimes, which makes them even harder to move without the nails wanting to come loose. 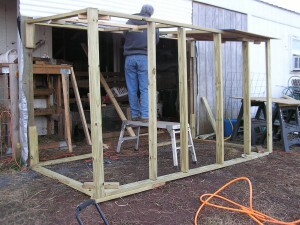 I’m using exsisting post from our barn construction to attach the front frame to, but there is already a frame there that has to be removed before setting in the two new frames. I couldn’t do this on my own, so that will need to be done tomorrow when Mark is helping. In this next photo, you can get an idea of what it will look like when we remove the tarp and boards and then fully install the new ones. That center board will be removed and in it’s place will be a door. I’m hoping to have this completed tomorrow, so I’ll have another post on that progress. Thanks for reading and please leave a comment. Happy building! I like to build things and if I can build things with free wood, that’s even better. 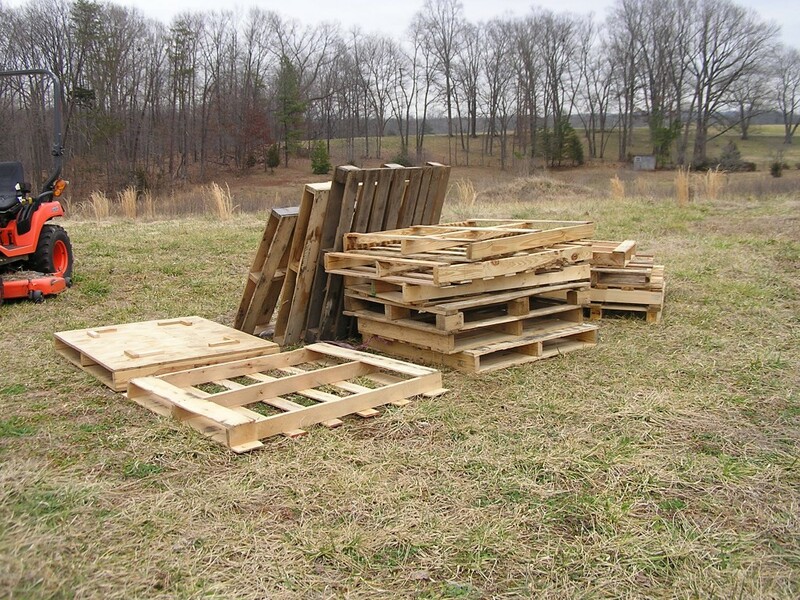 I found a great source for free pallets this morning. Of course, they really aren’t free because I did have to drive out to pick them up and in our gas guzzling truck, that takes anything out of the free category. I found the add on Craigslist last night and even though there was rain in our forecast, I thought I might run out there to pick up a few. My biggest concern was if I could actually load them up on my own. After a few turns into several unnumbered business parking lots, I finally found the place. There were already two men there, but they were in cars, so I knew they were limited by what they could take. One man left and the other offered to help me load if I needed it. How nice of him to offer! Anyway, I picked out a nice untreated one and it was surprisingly light and I had no trouble loading it into the back of the truck. The gentleman that was still there said he was looking for wood for his garden and I mentioned to him about planting vertically in palettes. He pointed out the ones he was looking at. 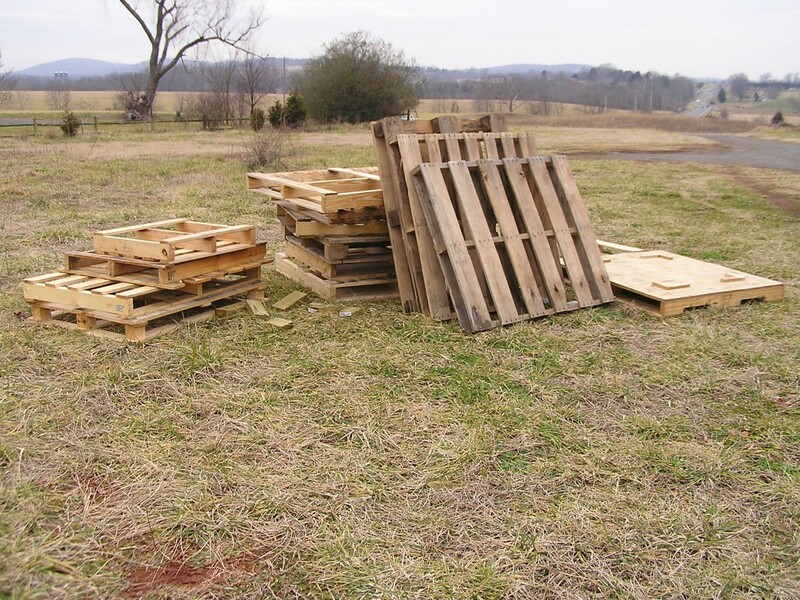 I was really surprised to find pallets with one side covered in plywood. Most of them had 2×4 frames and were untreated. I was really happy about that because it increases the uses for the wood. I quickly loaded all I could take, said good luck to my fellow scavenger and drove home with no issue. When I got them unloaded, it still had not started raining. It was not a hard decision to make another trip to the pile. This time I decided to time the trip. It took me 1 hour and 10 minutes round trip including the time to load up. The second trip, I would have easily accepted help loading. I’m not sure if the picked over lot just happened to be heavier pallets or my muscles were telling me I hit my limit. I did manage to get another full load, but I did leave behind some choice pieces. There were also some longer ones that I would have loved having, but I was not comfortable driving with the tailgate down. So, what am I going to do with them? Some I will cut up to use the wood. I want to make a compost bin with 3 of them. I’m also thinking about making a fence around my garden to keep deer out. I plan on planting a lot of leafy greens, so that might be a necessity. A few others I’ve decided to do vertical gardening between the slates. I have the perfect spot on one side of our house to put them in. I’ve started a new category for the pallets and plan on updated this blog with all the projects I make from them. 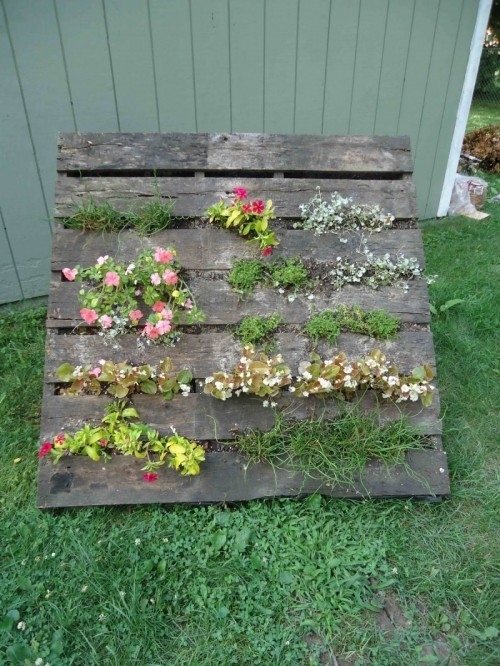 As always, please do leave a comment here, especially if you have used pallets and want to share your projects. I’m spinning yarn right now that is alpaca fiber from our boy Buddy and his half sister Sookie. It’s a nice shade of brown that blends nicely with colors. I’ve taken their fiber and blended it with hand dyed Merino wool, white faux cashmere and white tencel and added just a little hint of sparkly angelina. That may sound like a high percentage of other fibers compared to the alpaca, but it’s not. I used my blending hackle for this combination. What’s a hackle, you might ask. Here’s a photo of mine. The way you use this is to layer prepared fibers on top of each other. 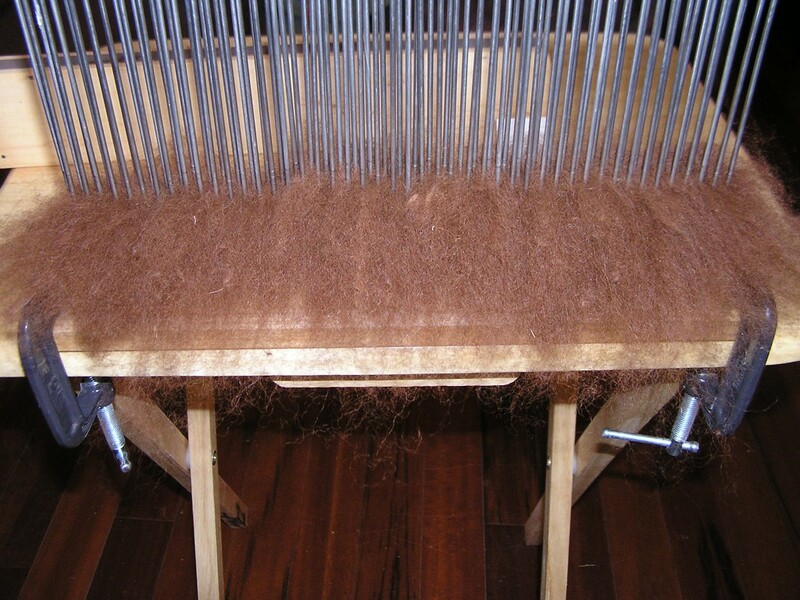 I started with a layer of alpaca fiber, then a layer of other fibers, then back to the alpaca. Here you can see the first layer of the alpaca. 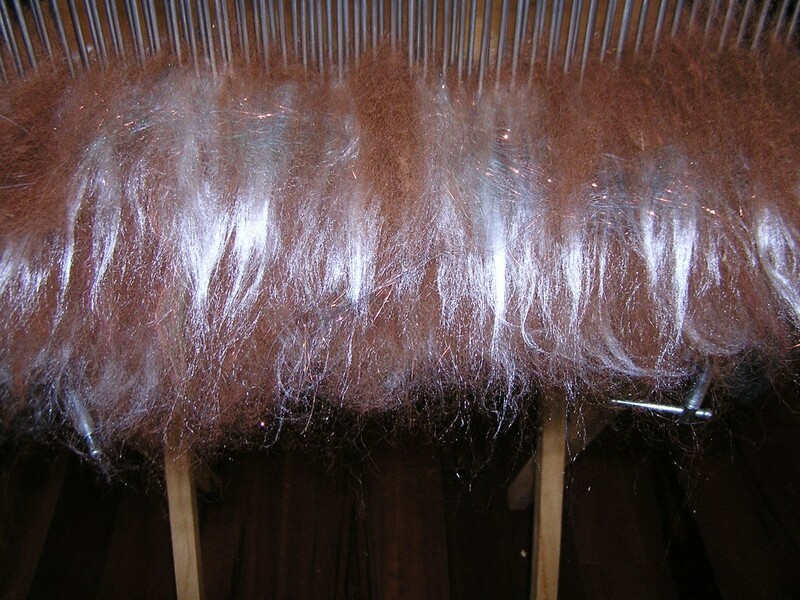 And here is other fibers layered in. This next photo is the finished layers. With this particular combination, I only did 2 sets of the combined fibers. 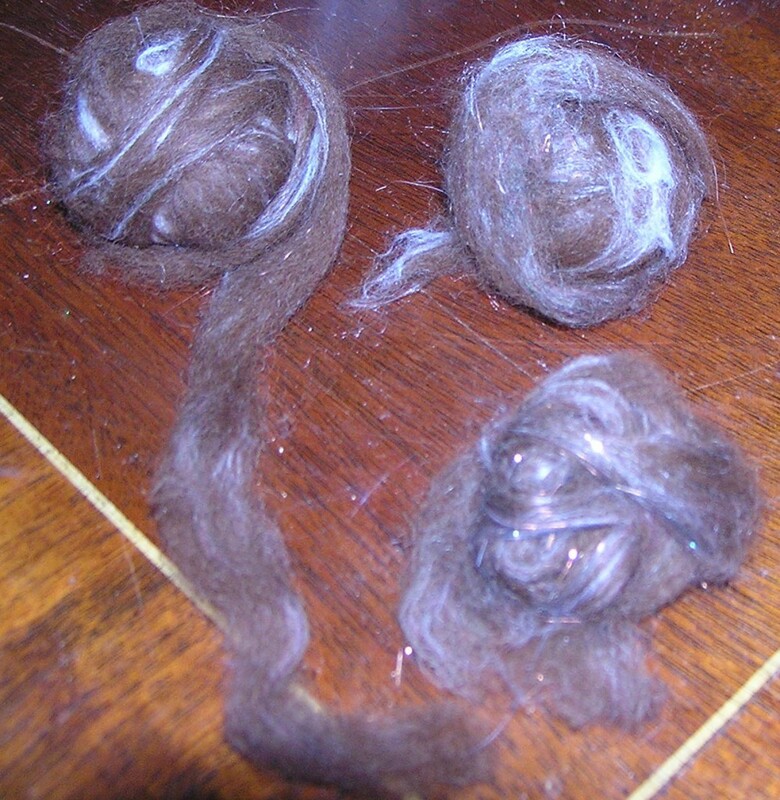 If I were only blending alpaca with one or two other fibers, I may do up to 4 sets. 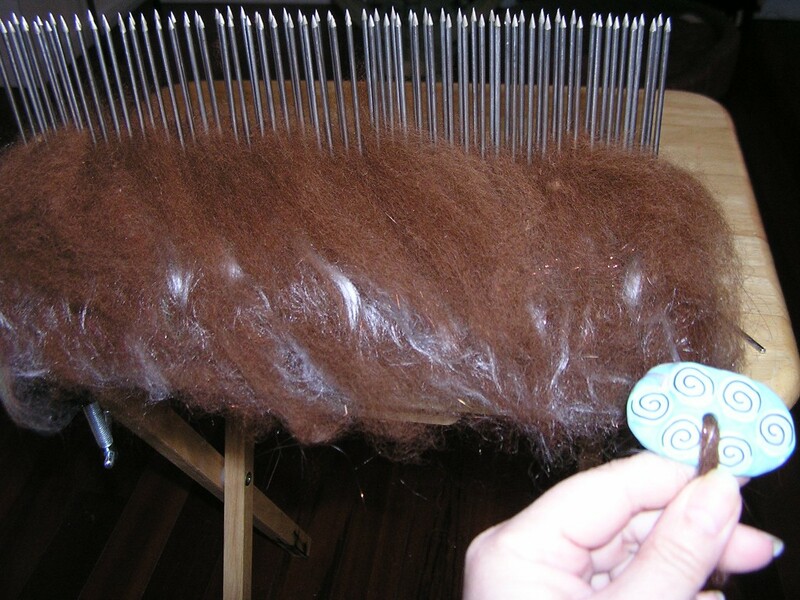 When you have all your layers set, you want to arrange your fibers on a bias as shown in the next photo. This just seems to work better and keeps the fiber flowing while you are using a diz and turning your fiber into roving. In the photo above, you can see a diz with one hole that was handcrafted by me from polymer clay. I have these in many colors and most come with a matching threader. You will need something with a tiny hook to get through most of the holes. This diz has one hole, but I also make them with 2 and 3 different diameters to give you more flexibility in the size roving you want to make. You can buy the set for $14. 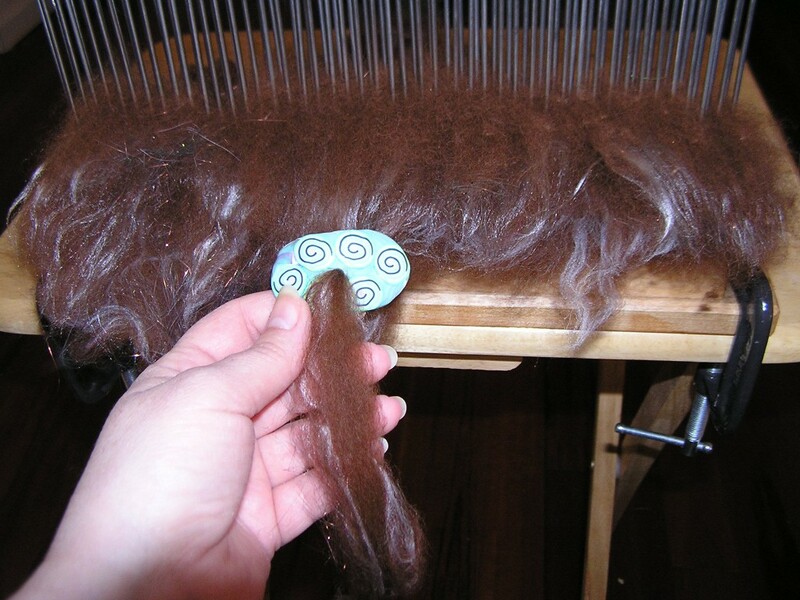 The way the diz works is you thread the fiber through the diz from the concave side and you pull the fiber through. Grasp the fiber between your thumb and index finger about an inch from the convex side of the diz and start pulling the fibers through the hole. 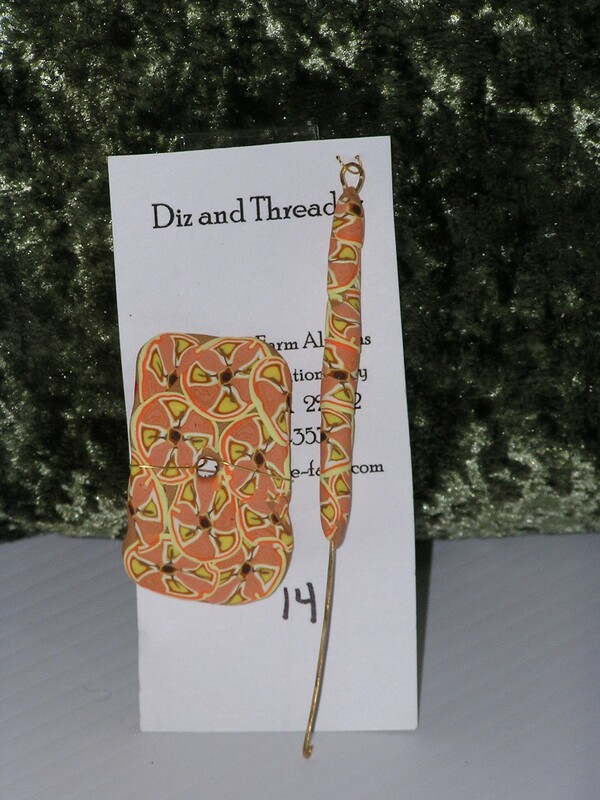 You will be holding the diz with your other hand and working it back and front catching fiber as you go along. Work it along the length until it’s all done. In the photo above you can see what the roving looks like as it’s being pulled through the diz. I use this type of blending when I want a yarn that has more definition in the different fibers. If I wanted a more uniform colored yarn, I would blend the fibers on my drum carder. 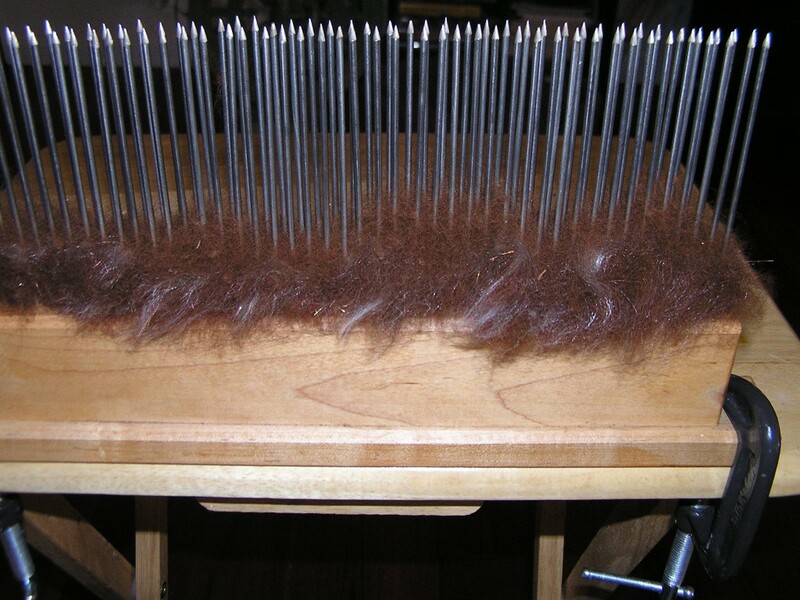 When I’ve pulled all the usable fiber off the hackle, there is still some fiber left on it. I pull this off and save it for carding. This next photo is the roving I’ve pulled off and wrapped into little balls. It’s all ready for spinning. This preparation makes a smooth roving and does align the fibers nicely and is perfect for worsted spinning. The yarn I’m spinning will be a simple two ply. When I’m done it will be listed for sale in our new web store. Here is one of my diz sets. I’m always happy to discuss alpaca fiber and it’s preparation. Please do leave a comment and I hope that this post has been informative.